Here's how to turn on AirDrop and use it to move files between an iPhone and a Mac. What are the limits of AirDrop? If only transferring large and small files was as simple as sending a Tweet – while being as private as handing something physical to another person. The good news? With Apple’s AirDrop (available in iOS and macOS devices) it already is. Here is everything you need to know to get to using this valuable tool. Apple introduced AirDrop with Mac OS X Lion in 2011, including the feature on iPhones when the company shipped iOS 7 that same year. The simple-to-use technology lets you pass audio, image, video or any other kind of file (including very large files) to another Mac or iOS device with almost zero configuration and zero stress, so long as you’ve got everything working right. Not only this, but there’s no file size limit, and you don’t need to wait for a file to upload to the Internet and then wait again to download it. This makes it much more convenient than uploading items to Dropbox, Box or iCloud in order to share them. AirDrop uses Bluetooth to detect other compatible devices that are on the same Wi-Fi network, and when you ask it to share a file, it will do so wirelessly. It’s a peer-to-peer connection, which means so long as you have Wi-Fi and Bluetooth enabled on both devices, you can share files even when you aren’t on a Wi-Fi network. Your data never goes online. On a Mac, you can share almost anything, but you must be certain the device you are sending it to can use what you are sending, or you’ll be wasting your time. On iOS, the digital assets you can share with AirDrop include photos, videos, contacts, Passbook passes, Notes, documents, PDFs, Mail attachments, items from the Files app, URLs, Maps directions, Books and more. AirDrop settings must be discoverable on both systems. Both devices must be awake. AirDrop does not work with Windows or Android devices, though third-party utilities (such as Air Transfer +) try to deliver some of this functionality. Some older Macs use an earlier version of the AirDrop software, which can be a little troublesome. You must be running iOS 7 or later and have Personal Hotspot turned off. You need to run OS X Yosemite or later on a 2012 or newer Mac. The Mac must not have “Block all incoming connections” enabled in Security & Privacy preferences. It’s easy to use AirDrop to share items with other iOS devices, with Macs, or between Macs and iOS devices. On an iPad or iPhone, AirDrop is controlled in Settings>General>AirDrop. You can set AirDrop receiving to off, to contacts only or to everyone. I usually choose to set the feature to Contacts Only in order to avoid being sent unwanted files by strangers. When you want to share something, you should first make sure AirDrop is active on both devices. Open the item you want to share and tap the Share button. If AirDrop is supported by the app you will see the AirDrop icon appear above the application and services rows. You should see an icon representing all of the available devices you can share to, find the one you want to send the item to and tap it. Your device will prepare the file, and the recipient will be told when the item has been downloaded to their device and asked for permission to accept it. It will appear in Downloads on a Mac, or automatically opened in the relevant app on iOS. To check whether AirDrop works on your Mac, just take a look at the Go item in the Menu bar – if AirDrop is listed there, you can use it. Choose AirDrop in the Go menu to open the AirDrop application. You’ll be asked to enable Wi-Fi and/or Bluetooth if either is switched off. At the bottom of the AirDrop application screen, you will find small blue words that let you define who you share files with:P No one, Contacts or Everyone. You enable AirDrop as a Share item on your Mac in System Preferences>Extensions; in the Share Menu item, just tick AirDrop to activate it. Ensure AirDrop is active on both devices and that they are both discoverable to each other. In Finder, tap Go and then choose AirDrop. Select the item you want to share and drag-&-drop it onto the icon of the system you wish to send it to in the AirDrop window. The item will automatically be sent to the device, and the recipient will be asked if they want to accept the file. On a Mac, it will automatically be placed in the Downloads folder. On iOS, the item will automatically open in the relevant app. 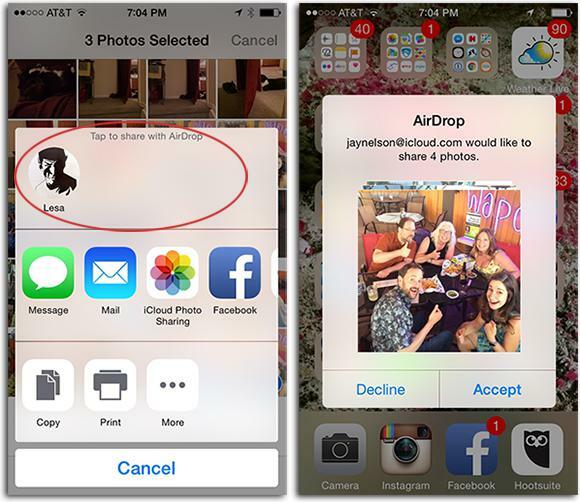 When AirDrop is enabled in the Share menu, you can use that to share from within compatible apps. In this case, all possible destinations to share items to will appear in a list; tap one to send it to them. Every silver lining ships with its very own cloud, and AirDrop is no exception. There is some AirDrop incompatibility between Macs and iOS devices. If you are trying to use AirDrop to send a file to a Mac that is running OS X Mavericks, Mountain Lion, or Lion then you must ensure the recipient has an AirDrop window open on their system first. You may also find AirDrop a little less stable if you have a device that is interfering with your Bluetooth network. If you leave your AirDrop settings set to receive items from ‘Everyone’ you may suffer cyber-flashing, where people send unwanted images to people they find on their Bluetooth network. Don’t forget, in most cases you’ll solve any AirDrop problems by switching the feature off on your system, restarting your Mac, iPhone, or iPad, and switching AirDrop on again. As I most Computerworld readers know, nine times out of 10, "Switch it off and Switch it on Again" fixes almost every problem you find on a Mac, iOS device or PC. You can make it super-easy to share AirDrop files from your Mac – just pop an AirDrop icon into your Dock and you can do so using drag-&-drop. You’ll be in a new Finder window that contains several applications, including AirDrop. All you have to do is drag it to your Dock, and in the future, sharing files using the system will be even more of a breeze; just drop the item on the icon in the Dock. (Or tap Command-Space and type AirDrop until it shows in search results).